Lusting over Acne??? "Acne" is a word most of us have dreaded since we were teens, but these days it has taken on a different meaning among fashion crowds - effortless cool. Swedish brand, Acne (Ambition to Create Novel Expressions), was originally established as a creative consultancy in 1996. The fashion component of the company took off when founder, Jonny Johansson’s jean designs became popular with friends and clients. Today, it encompasses men's and women's ready to wear, footwear, accessories and denim. To learn more about ACNE, check out a great article in the Wall Street Journal article, here. 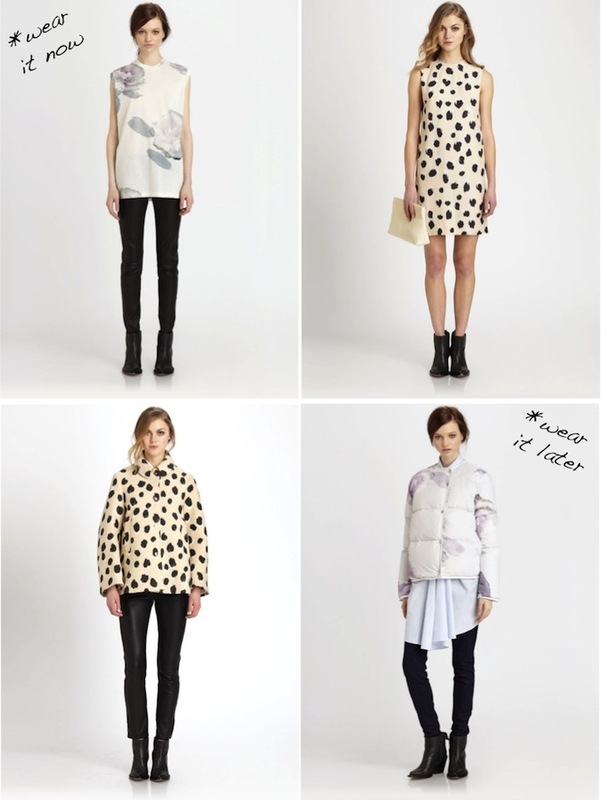 Acne's pre-fall 2013 collection perfectly encompasses their signature style; styles are modern and architectural yet have a bit of feminine whimsy. Their watercolor floral print sweatshirt and abstract leopard print shift dress are my favorite items new to stores. But I can't overlook Acne's street-style-star staples including cowboy inspired ankle booties and insta-cool leather jackets. With Acne's pre-fall clothing and accessories starting to roll into stores, it's hard to not want to dress in an oversized leather shirt dress mid July, but luckily their summer offering are pretty rad. And, some of them are even on sale:) I have my eye on a couple of their on sale dresses in fun colors. I bought a black dress by Acne last fall, in the same cut as the green below and I absolutely love it (and so does my guy!). I really love ACNE. They're clothes are always the perfect mix of tough and chic–these looks are getting me excited for fall! ACNE has some seriously amazing pieces and I love that some are on sale. Trouble for the wallet. I'm obsessed with ACNE jeans! They fit me better than any brand out there. The collection looks really wonderful! How could anyone not love Acne?! Such great stuff! Love this collection! Looks really nice. Thanks so much for visiting my blog and leaving such a sweet comment. I don't think I've ever met someone who didn't lust over Acne, sigh. They are amazing enough said. Love this post and the adorable outfits! acne is just so cool.. been wanting some boots from them..